Leviticus 19:35-36 You shall do no wrong in judgment, in measurement of weight, or capacity. You shall have just balances, just weights, a just ephah, and a just hin; I am the LORD your God, who brought you out from the land of Egypt. Currency manipulation is global issue. The above verses are two of many examples provided in Scripture. All currencies are not balanced the same. Imagine that, the world’s economy is out of balance in regards to the standard of the Bible. All currencies are not created equal. There are global economic consequences when standards are out of balance and there is reconfiguration. God is not a big fan. Many Researchers have been forecasting a rising US Dollar. This seems like an impossibility, but technical methodology from several different disciplines are coming to the same conclusion. A top researcher in March placed a 103.8 target from 88.1; currently, the dollar has risen to 92.46. Should the target be exceeded, a Spike could develop going much higher. The Dollar rose .7% on May 1, 2018 alone. A strong dollar will pressure the repayments of debt across the Globe in an environment of struggling Municipalities, States, and Sovereign debtors. 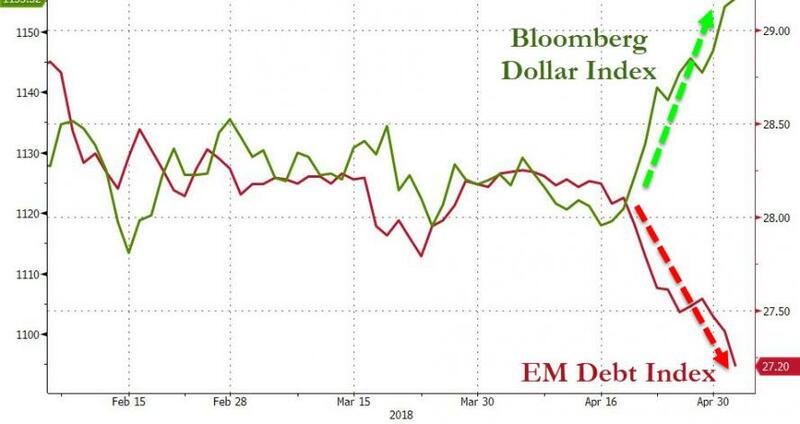 A stronger dollar will not only change the repayments dynamics, but the exports in Emerging Market Countries are affected as Commodities expressed in US Dollars lose value. A stronger Dollar is enhanced not only by the perception that the US Economy will be stronger than any other, but also by the Interest Rate differential across the Globe and the avowed Federal Reserve policy of raising short term rates. Higher rates from both the Federal Reserve and the LIBOR affect 40-60% of all Global Debt; currently exceeding the 2008 Debt Record and now over $217 Trillion Dollars. Charles Nenner called the 10 year Treasury low at 1.6% in July of 2016. The trend line from 1981 has been broken at the 2.65% level and has now exceeded 3%; better than an 85% increase. With the trend line broken, rates could rise swiftly and approach 4.5% faster than thought possible. Normalization is occurring as Central Bank intervention recedes. Normal could easily be 5-6%; a double from here. Prices in asset classes will be affected. Housing prices will be compressed as rates rise; Home buyers buy based on payments. Higher rates equal lower affordability; some Luxury Markets are already affected! Equity prices will be affected as repatriated funds are reduced inversely with a stronger dollar. The US Dollar has depreciated 24% since the Presidential election. Take for example a US manufactured auto sold for 20,000 Euros in Germany in December 2016; the same car sold for 20,000 Euros in December 2017 netted the US Manufacturer 20+% more profit due to the Dollar decline; great news for Stock Prices. Bad news when the US Dollar rises; the same formula works negatively in reverse. Look for earnings to decline; stocks are correlated to earnings. Need I mention Bonds? Higher rates will decimate Bond values as well as higher rates will cause many more defaults across the Globe, again affecting the value of Fixed Income. Commodities will also be negatively affected by a spiking US Dollar as it will take fewer Dollars to purchase in local Currency as well as higher rates will certainly curb demand. What to do? Everything cycles! Raise cash to purchase assets at lower US pricing. Research is indicating it will probably be a Spike; vicious, but not exceedingly long term. This will present HUGE opportunities for those prepared. Every Investor has personal goals. Review your portfolio and make the proper adjustments. This entry was posted on May 3, 2018 at 5:59 PM and is filed under Michael Douville with tags bonds, cash, commodities, currency manipulation, Debt, economic cycle, emerging markets, Euro, interest rates, just, Leviticus 19, Proverbs, US dollar. You can follow any responses to this entry through the RSS 2.0 feed. You can leave a response, or trackback from your own site.